After Whysoserious.com was shut down, it redirected to Rent-a-clown.com, a fictional entertainment company. 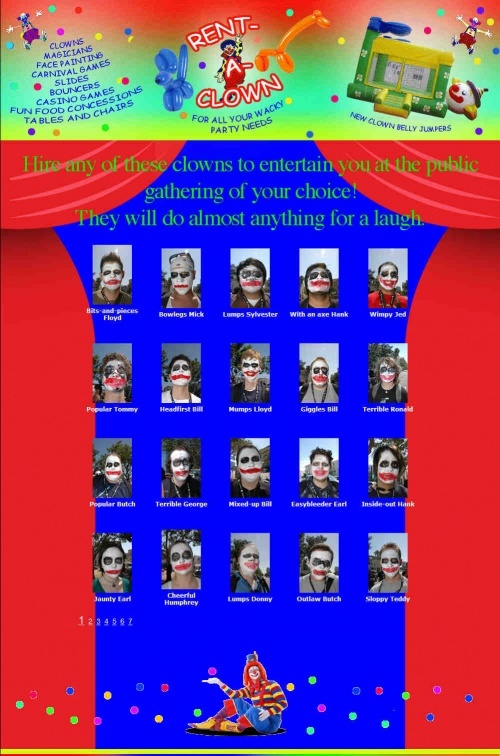 The employee pictures are actually pictures of the Whysoserious.com/ComicCon participants in Joker makeup. Letters and balls flash, and a cheery circus MIDI plays in the background. Glad to see you’re still alive and kicking. I’ll be in touch before Poisson d’Avril. Participants are called on their phones by a live person and informed that they are one out of 17 recruits who replied to the text message on March 26. They are then given a letter and then told to share their letter with other "accomplices". If a cell phone owner is unable to be contacted, their letter is given to a participant who was already called. "You ready for a job, clown? The boss wants me to start you off easy. I'm going to give you a secret letter." The list of letters is as follows, as compiled by participants who have shared their letters on SHH!. Xnbomb, Gupfee & Giskard: "E" as in "Elephant"
bassboy616 & Mr.Walken: "Y" as in "Yo-Yo"
punk: "R" as in "Ransom"
Pennyworth: "V" as in "Victim"
BriGonJinn/GQJoker: "A" as in "Assault"
BigTonyVegas: "N" as in "Narcotics"
EddieNashton: "C" as in "Clown"
Screwpa! : "A" as in "Action"
vlkers54: "L" as in "Laugh"
fceeviper: "G" as in "Gun"
FlyingMonkey: "C" as in "Clown"
Gerik: "E" as in "Elephant"
Matt100: "L" as in "Laundry"
This page was last modified 04:12, 26 May 2009. This page has been accessed 64,580 times.